Only 2h 40m 43s left! The Renderosity Community is excited to announce that we've partnered with the team at Reallusion to bring our members a full suite of products and learning tools that will enable you to get more out of your Poser & Daz Studio content. Game development can be a long and painful process, especially for indie game developers with limited budget and manpower. The Renderosity MarketPlace is now offering Reallusion's Character Creator 3 (CC3) as the go-to gaming solution for the DAZ & Poser community. 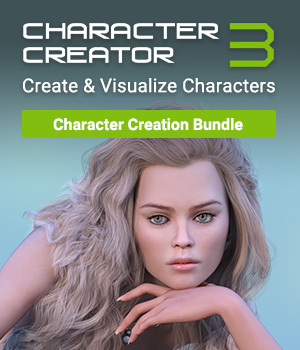 Character Creator 3 (CC3) is a full character creation solution that helps you easily create, import, customize and export realistic and stylized character assets. 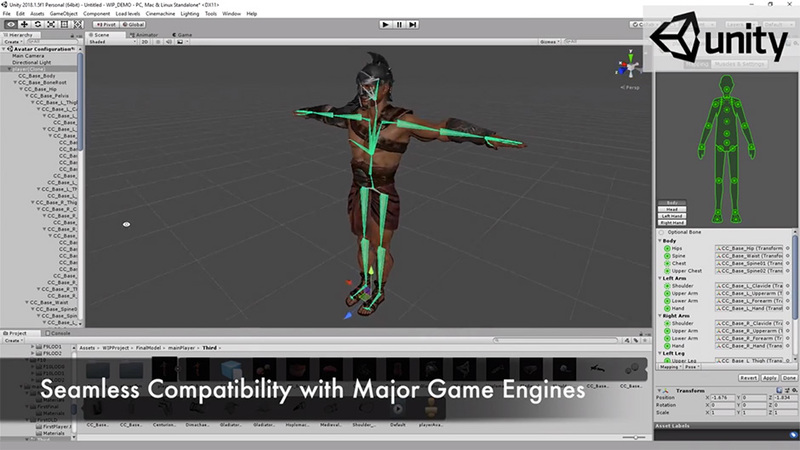 Now the Poser and Daz communities can connect their content into one unified system for 3D character generation, animation, rendering and game design for Unity and Unreal. 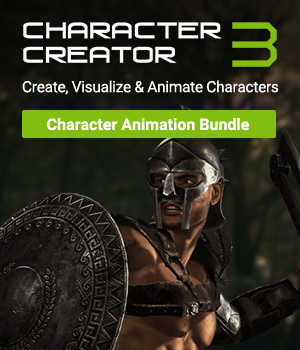 Characters created or imported into Character Creator 3 are further enhanced with iClone to animate the characters with a motion library, motion capture, facial animation, lip-sync or keyframe animation. The complete character pipeline from Reallusion features Character Creator 3 and iClone to unify Renderosity content into assets ready for animation and games. Features include highly-morphable character bases with a quad-based mesh that are ZBrush compatible with GoZ, subdivision and gamification with InstaLOD, motion capture enabled characters for body and face animation, and Iray rendering. Reallusion and Renderosity are bridging the Daz and Poser communities with Character Creator and iClone. Now content creators have more capability with their Renderosity content for animation and optimization of characters to games and even AR or VR. Reallusion is proud to offer a solution that is complementary to Daz and Poser libraries and extends the possibilities for Renderosity content creators. 1. Bridge Poser and Daz assets with CC content for more creative possibilities. 2. Import OBJs with auto Skin Weight Transfer for quick clothing creation. 3. Convert DAZ and Poser content into real-time PBR for game engines. 4. 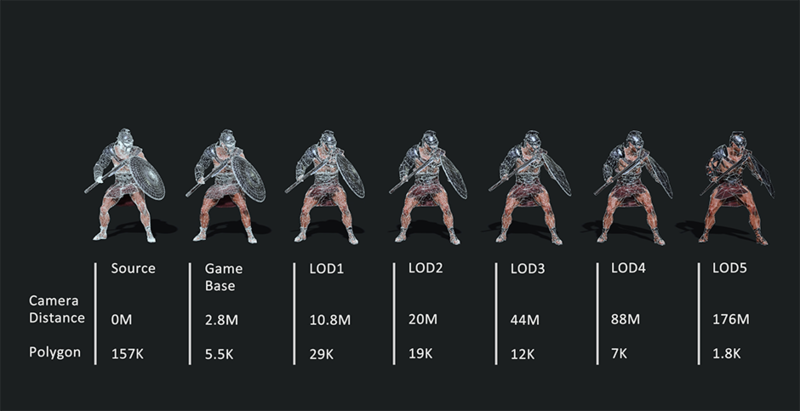 Optimize polygons, remesh and unify textures for game characters with LOD. 5. Render professional photo-quality visuals with interactive Iray render. 6. Animate on-the-fly with motion libraries, facial lip-sync and soft-cloth physics. 7. Capture face, body and hand motions with popular mocap hardware. Requires iClone Motion LIVE - Sold separately. Character Creator 3 is fully compatible with content from Daz 3D, Poser and HiveWire. Giving content creators and owners of these libraries, a unified platform to import characters, mix and blend clothing, animate and export for games. With the automatic Transformer tool in Character Creator 3, users can one-step import and convert characters, clothing and accessories from FBX. 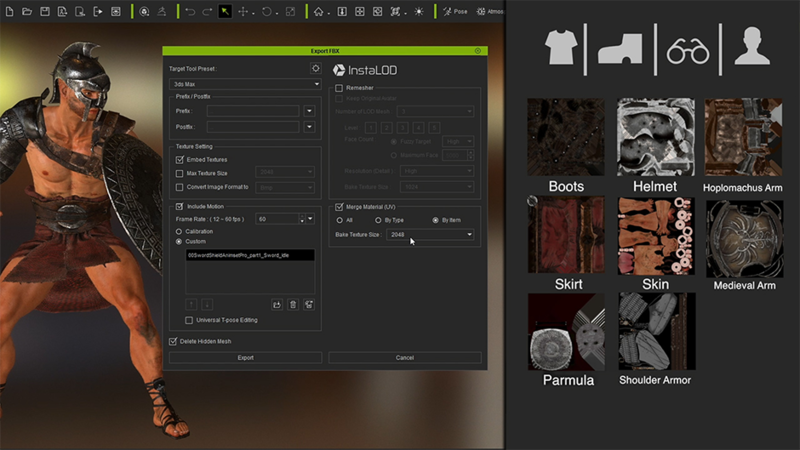 Transforming content will auto-detect morph, clothing, accessories and convert the content automatically to cloth layers and assets for editing in Character Creator 3. The clothing can then be saved as individual elements inside the Character Creator library, and the character morphs can also be saved or blended with other morphs to generate and new design later. Smart Transformer design to fast Import Daz Genesis and M4, V4 character assets. Convert all texture channels to real-time PBR materials standard. Auto Daz-to-CC character retopology and UV texture baking for assets compatibility. Import morphable hair and cloth, and keep their morph editing capabilities. Creating clothing from imported OBJ assets is easy, thanks to auto rigging. Use OBJ models from external clothing assets to import and transfer the skin-weights from CC3 clothing templates. Refine surfaces of clothing after using the Edit mesh, and the push-and-pull brush tools. Skin-weight editing is easy, just refine the auto-skinned cloth with a spectrum of weight editing tools that support vertex weight assignment and weight painting. Users can also use flexible smooth brush, brush projection modes, and mirror editing brush options right inside of Character Creator. Content creators can use Character Creator to view their Poser and Daz characters and content in industry-standard realtime PBR shaders and GI (Global Illumination) lighting; breathing new life into older content! Users can gain access to roughness and metallic materials, along with compatibility in iClone, Unity, Unreal and Substance Designer. Character Creator also supports real-time mesh illumination for Indirect lighting using NVIDIA Voxel GI technology. All this plus the ability to use real-time Ambient Occlusion (AO), High-Dynamic Range (HDR), tone map, and blooming effects for that extra dazzle in displayed content. 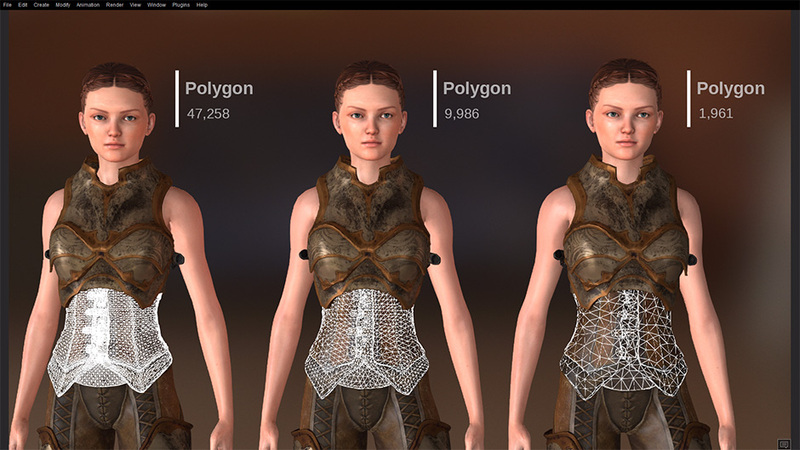 With Character Creator 3, users can now optimize their original high polygon assets for live performances, unify texture maps, gamify their assets for game engines, AR, VR and more. You can repurpose your assets for the worldwide 3D game industry, with InstaLOD’s model and material optimization technologies to generate game-ready characters that are animatable on-the-fly with multiple LOD (level of detail) outputs. The native Game Character Base topology lets you build characters inside with a 10K polygon base, to create a massive amount of non-playable characters (NPC) with true-to-life body and facial animation without any serious performance drop in real-time game engines, or sacrificing visual quality. The InstaLOD integration makes CC3 an unmatched game character design platform, fulfilling the complete character pipeline on polygon reduction, materials merge, texture baking, remeshing and LOD generation. Iray rendering allows the creation of state-of-the-art workflows with access to photorealistic and physically based rendering technology. It does this by simulating real-world physical behaviors of light and materials. 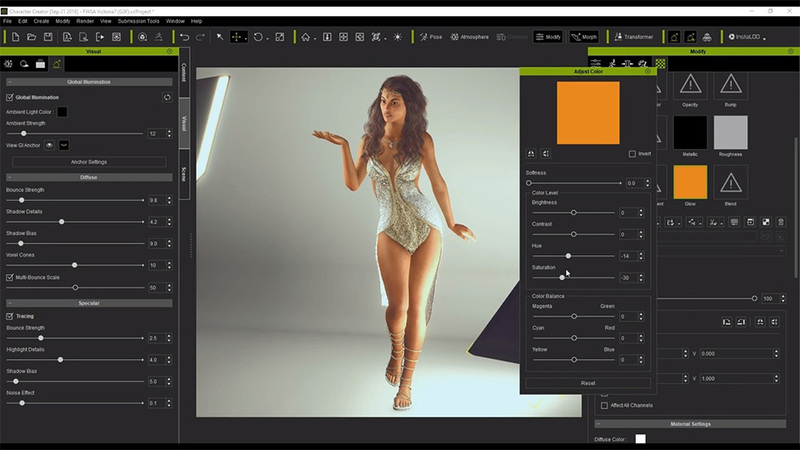 The Iray implementation into Character Creator comes with a collection of easy-to-apply materials that do not require the user to have vast knowledge in computer graphics techniques, thanks to its material and lighting auto-conversion and extensive material library design. Connect your Poser, Daz and HiveWire content through Character Creator 3 for an almost endless supply for animation resources that any beginner can use. Transform characters and assets, and morph characters into characters that work seamlessly with iClone realtime animation. A perfect companion tool for any Poser user -- iClone is a fast and cost-effective 3D animation software that helps you easily produce professional animations in a very short time as it simplifies the world of 3D animation in a user-friendly environment that blends animation, scene design and cinematic storytelling. Inside iClone you can employ audio lip-syncing for character dialogue, along with two physics engines to simulate collisions and soft-cloth interaction. The seamless Character Creator 3 compatibility with iClone motion libraries, also opens the floodgates to a whole new market for AAA quality iClone animation files for realtime game engine performance. Adjust character poses and facial expressions in Character Creator. CC3 Drag-and-drop character compatibility with iClone. Access to powerful iClone character animation functionality. After converting your content with Character Creator 3, you can then utilize motion capture devices, to lightspeed your animations inside iClone. 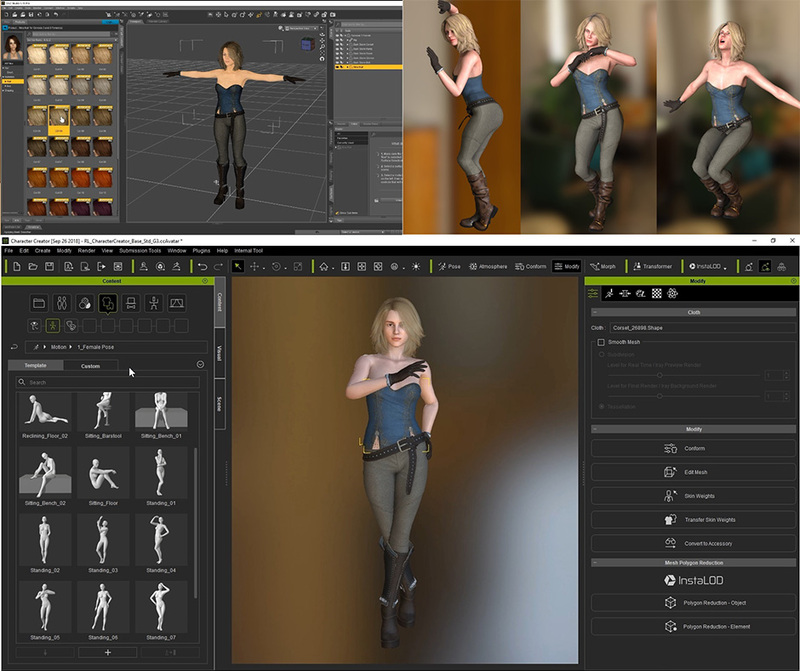 iClone’s motion capture platform (Motion LIVE) connects motion data streams from multiple industry-leading mocap hardware, to simultaneously animate fully-rigged 3D characters from Poser, Daz Studio, and HiveWire. Learn More. *Motion LIVE is a plug-in for iClone 7, and is sold Separately. Character Creator 3 is fully supported by a vast collection of free learning materials that will get you up and running in no time. Start from the basic installation and UI tutorials before heading over to the Daz importing, and more advanced tutorials. To view more free tutorials from Reallusion at Renderosity, please Click Here. Further assistance in getting started with Character Creator 3 can be found in the Online Manual. For additional information and help, please visit the Reallusion Forum at Renderosity where you can ask questions, post suggestions and even showcase your latest Character Creator creations. 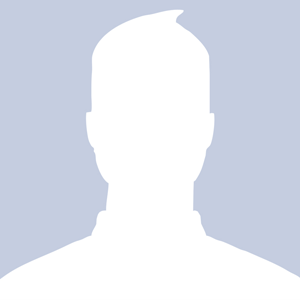 Reallusion Team members will be monitoring this forum regularly. When you purchase either of the two (2) product bundles listed below, you'll receive a complimentary 12-month subscription to Renderosity's Prime Membership for FREE! The offer above is NOT valid for current Prime Members. Currently a Prime Member? You'll automatically save $50 on either of these bundles! As an active member of the iClone online community I can say, with confidence, that clothing creation & rigging to conforming for ALL third party supported figures (M4, V4, Hivewire, bases and all Daz genesis) is as easy as using the transfer utility in Daz Studio (perhaps easier). CC3 will open up many opportunities of New vendors entering the Reallusion content market with the option to easily support any figure from the legacy Millenium4 to the latest Hivewire and Daz Genesis bases as well as the new high-quality Reallusion base Males and females. The IRay render engine in Character creator 3 renders with the exact same quality as the one in Daz Studio (assuming one has the required NVIDIA hardware). I personally see CC3 as the first truly viable to alternative to Daz Studio that can access All of the genesis bases natively with FULL, OFFICIAL technical support of the highly responsive team at Reallusion. This is truly an exciting time for the Renderosity community!!! The arrival most versatile 3D figure creation and animation tool on the Market (Character creator 3), will usher in a new Era of Opportunity for content vendors both old and new. Congratulations to both Reallusion and the Renderosity Marketplace team!!!! That's funny. As I'm reading down, I'm wondering what wolf359 thinks of this mashup. Then I find your comment at the bottom. Wolf, what PC graphics card should I get for this? I am quite interested in purchasing this but having a hard time finding any details of how this works with Poser? Can you export to Poser? The online manual and tutorials only refer to Daz3d? is this just an extension aimed at Daz3d users? So more is coming for Poser users all the time! We think this is important as well. Too bad: Window$ only, https://www.reallusion.com/character-creator/download.html#system-requirements, but I use macOS only. 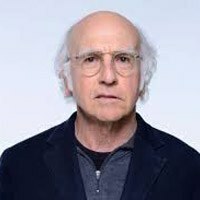 Hello, is the 3DXchange 7 PRO included? This is good sale price right now, but it still has a critical missing component, if I understand the reallusion sales info correctly. If you plan to work in iclone for scene creation and animation you will need to buy 3dexchange pro ($199) in addition to this package in order to import props and other scene elements from poser or daz or any other format. Character creator only imports specific poser or daz figures:M4,V4,Gen 1-3 &8. While good, it is still incomplete. I you want export the character animation back to Poser or Daz so to use them in your DS or Poser scene, you will need to buy 3dexchange pipeline ($399) to export the animation created in iclone. Or you can buy a whole bunch of reallusion native content for props and such. Can all the Poses be imported in CC3, whether they have been created in Daz or Poser ? The way it works is unclear to me. are the JCMs coming in with the transfer to CC3 from Daz? @legarc: I might ask that you pose this question in the Reallusion forum. I'm guessing they'll be quicker to see it there than here. @Chasoqueen 3DXchange is not inlcluded in these two packages as they are more focused on the Character Creation and Animate in iClone. 3DXchange is not required if you would like to import Daz or Poser content directly to CC3 Pipeline (included in both packages on Renderosity store).